Today's painting was inspired by recent travels from Washington State to Central Oregon. As travelers move across the Columbia River into Oregon, Mount Hood begins to watch over all. The original painting was created on an 8x10 inch canvas, but with the marvels of modern digital photography, fine art prints up to size 28x30 inches can be created. To view the different sizes and surfaces on which this painting can be reproduced, visit this link. 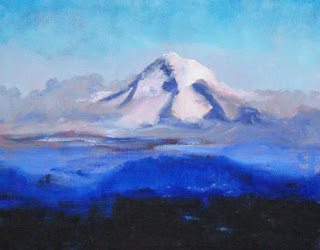 You can view more oregon landscape paintings at Fine Art America. 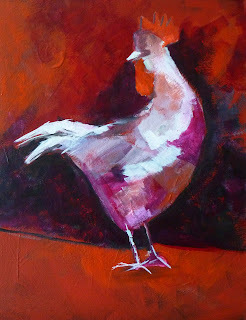 This abstract chicken painting is the result of a recent journey in experimentation with acrylic paints. I've always painted in oils and that has been my paint of choice, but it does have draw backs. It takes a long time for the paint to dry. If a painter fusses too much, the colors become muddy. There are health issues associated with many of the chemicals used, but I've always been more comfortable with oils. I guess because using oil paint was a very early and pleasant experience in my life. However, as you may have noticed if you keep up with my blog, I've been doing a lot of work in acrylics. Acrylics also have disadvantages, but for me the biggest one has always been that they dry too fast. But, since I discovered the Stay-Wet palette, that issue has disappeared. With that obstacle out of the way, I've discovered some wonderful advantages that are starting to steal my heart. If a painting doesn't turn out like I like, I just paint over it. I can fuss and fuss and fuss, and if the colors get muddy, wait a few minutes, the paint is dry and I can start all over again. So this chicken is the third painting I've done on the same canvas. The first two were ugly disasters that I freely covered. No wasted canvas, no regrets and a wonderful texture covers the canvas. I love this abstract chicken. I've nurtured him, and now he is finished. Both the original 11x14 inch painting and prints in several sizes on several surfaces are available for purchase. Visit here for details and a larger image. Although we sometimes feel alone, actually we are not. This tree, though seemly isolated and alone, is really surrounded by the beauty of nature, the sky, the ground, the textures of the earth. 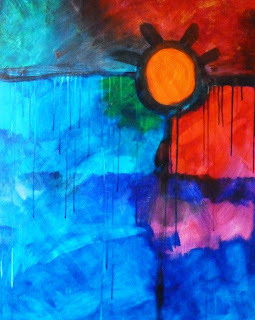 The painting was created on an 18x24 inch gallery canvas using acrylic paints. The sides are painted black and it can be hung with or without a frame. The original painting is for sale or prints can be ordered here. 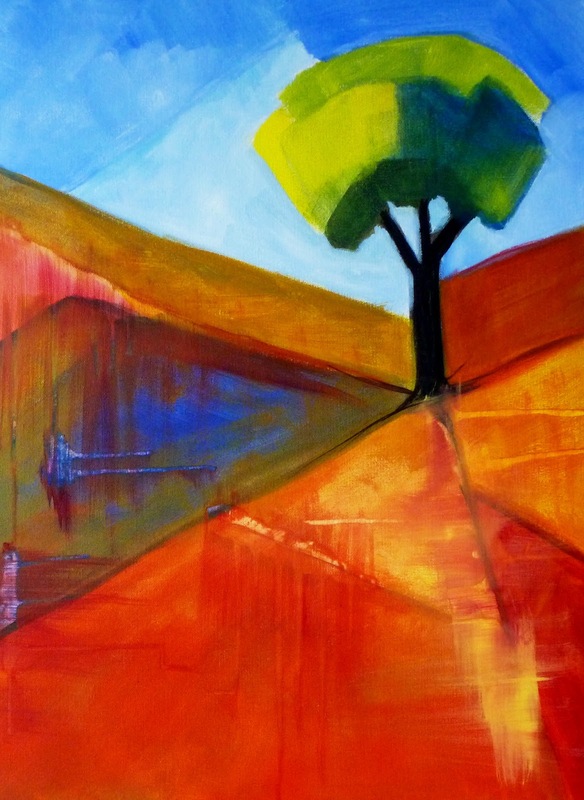 There is a story behind this 24x30 inch abstract. It starts this way: Last week I took a much needed vacation to Central Oregon, one of my all time favorite places to visit. I had planned to do many things: paint outdoors, hike, take lots of reference photos, bicycle, and relax. First day there, I enjoyed a delightful mountain bike ride through the desert scrub of the Central Oregon landscape. There is a lot of dust, scrubby pine trees, and rocks. It was glorious until I hit a rock that threw me off the bike. I landed on my knee and that was the end of the ride. I limped back about a mile to the end of the trail. With a fractured tibia, the rest of my plans went on the shelf. Today I am back home. I wanted to paint something large that would help relieve my frustrations at the slow pace I now keep and the loss of a well-deserved vacation. The result is this painting which I call Fire and Ice. It is metaphoric on many levels as you might imagine. Prints are available here.